This section documents several useful charts which can be used along with the operation of this program. For a description of how various files are formulated go to 8.0 Inventory/Journal files setup. This files may be found on the CD under the "Useful_Files" directory. The below chart is used when the patient has astigmatism. It shows how focometer readings are paired together. Should the patient see one of these figures then you should instruct the patient to look for the companion figure. If the patient sees just the top figure (all lines clear) then he/she has no astigmatism. The below figure is used to assist you in reading the scale on the Focometer. Note that when the focometer is fully extended, this is what you will see. 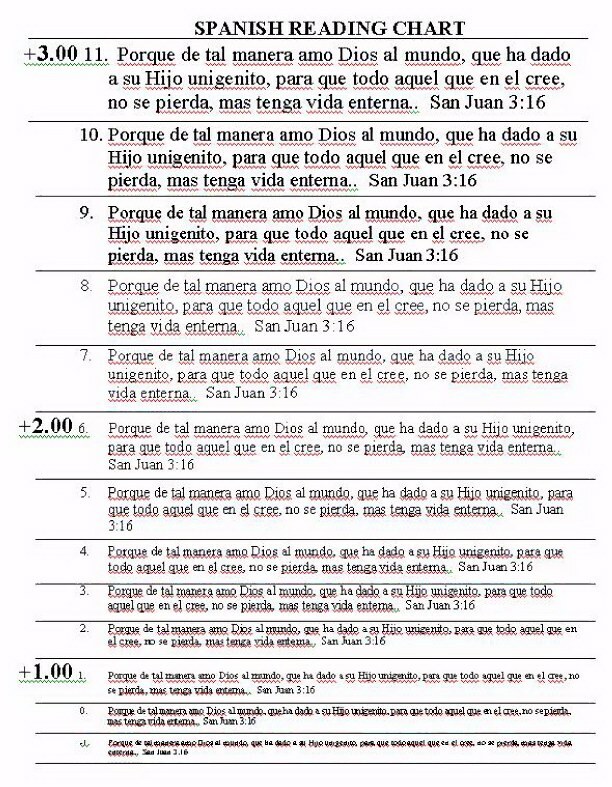 The below figure shows a Spanish reading chart which has been used many times in Honduras. The way you use the chart is you ask the patient what is the smallest line number he/she can read. If, for example, he/she can only read the top line number 11 you need to give him/her a pair of +3.00 glasses. If he/she cannot even read the chart look for something stronger than +3.00; HOWEVER, if the patient is putting the page very near his/her nose, then you may need to look for prescription glasses with a "-" (minus) value. For line 9 and below give them +2.50. If the patient can read line 6 or below then give him/her a pair of +2.00 glasses. If the number is 4 and below then make the power +1.50. If line number 1 then try a +1.00 or smaller. These power number are guesses but frequently they are right the first time. Focometer Reading.ppt This is the above Focometer reading chart in Microsoft Powerpoint 97 format. Focometer Scale.ppt This is the above Focometer Scale drawing in Microsoft Powerpoint 97 format. Honduras ALL Labels.xls This is an Excel 97 spreadsheet with multiple worksheets that are useful to print labels for the glasses, the glasses bag, and boxes. Honduras Spanish eye chart.doc This is the above Spanish eye chart in Microsoft Word XP format. Total_inventory.xls This is the glasses inventory used with this program in Excel XP format with column headings. Total_inventory.csv Same as above in comma delimited format.